General Tesler uses a pathogenic code on citizens of Argon to create an army of followers loyal to Clu. 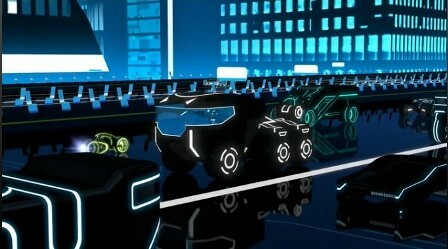 At 1:12 in the episode, a number of different kinds of light vehicles are seen on the expressway in Argon City. The character of Keller, inventor of the pathogenic code in this episode, is probably named for Sister Mary Kenneth Keller (1913-1985), a Sister of the Sisters of Charity of the Blessed Virgin Mary and a computer science pioneer who was involved with the development of the BASIC computer programming language. We see ambulances in the system for the first time in this episode. At 16:24 in the episode, Pavel asks Keller, "Why the long face?" He asks because she is unhappy that her research is being used by Tesler as a form of mind control on the citizens of Argon. But the question may also be a bit of a joking wink to the fact that the art style in Tron: Uprising uses rather long faces on most of the characters. At 17:28 in the episode, the dirigible's control wheel displays "135.5 MPH". Is MPH supposed to be "Miles Per Hour"? If so, it seems odd that a term like "miles" would be used in the system (but not impossible). At 18:13 in the episode, notice that the mind-controlled Mara has destroyed the "V" in the TRON LIVES graffiti, turning it into TRON LIES.